The Viking Professional Performance 5-Ply Stainless Steel Non-Stick Fry Pan features the PFOA free, Eterna non-stick coating surface making cooking easy by requiring minimum amounts of cooking oils or fats, yet retains the searing ability of a traditional fry pan. Viking Professional 5-Ply Stainless Steel Cookware combines four professional grade aluminum exterior layers with an 18/10 stainless steel interior, to deliver the elegance, performance and quality expected from the modern home chef. The performance of this cookware is driven by three layers of aluminum alloy, bonded between the magnetic stainless steel exterior layer and stainless interior, which work in unison to deliver optimal heat transfer and cooking performance. Professional 5-Ply Stainless Steel Non-Stick pans are safe for use on all cooktops including induction, in the oven or on the grill up to 500F/260C. This line features the Viking signature stay-cool handles, which are ergonomically designed to fit hands naturally to provide balance, leverage and grip. Viking Professional 5-Ply Stainless Steel Cookware is dishwasher safe, includes a manufacturer’s limited-lifetime warranty and is made in the USA. The Viking Professional 5-Ply 8 Inch Non-Stick Fry Pan provides the home chef with the ability to scramble eggs, to saut vegetables, or to quickly sear meat or seafood to perfection before finishing in the oven. Designed with that versatility in mind, this fry pan combines low, flared sides for easy turning or stirring, along with a flat, nonreactive cooking surface that retains and distributes heat evenly. Viking, designed to deliver Professional Performance for Your Home. The Professional Insulated Journeyman 300D Tribal Bib Pant features Heavy Duty elastic suspenders with a quick release buckle as well as an insulated detachable bib. The insulated pant has an elasticized waist with a zippered fly and 13″ boot zippers with Velcro covers for easy access. 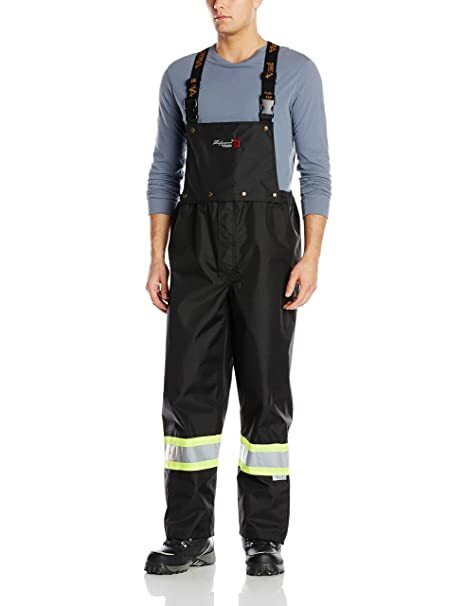 The Professional Journeyman 300D Tribal Bib Pant features Heavy Duty elastic suspenders with a quick release buckle as well as a detachable bib. The pant has an elasticized waist with a zippered fly and 13″ boot zippers with Velcro covers for easy access. Viking Professional 5-Ply Cookware is constructed to maximize heat transfer for even heating across the base and up the sides of the pan. The stainless exterior features an elegant satin finish and is magnetic to ensure compatibility with all cooktops including induction. The three layer aluminum core works to transfer heat evenly and quickly throughout the pan. The 18/10 non-reactive polished stainless interior is easy to clean and maintain. The Professional 5-Ply Stainless Steel series is safe for use on all cooktops including induction, in the oven, broiling or on the grill up to 600F/315C (nonstick pans up to 500F/260C). This line features the Viking signature stay-cool handles, which are ergonomically designed to fit hands naturally to provide balance, leverage and grip. The side or “helper” handles and lid handles are designed to be easy to grip with a towel or oven mitt. Viking Professional 5-Ply Stainless Steel Cookware is dishwasher safe, includes a manufacturer’s limited-lifetime warranty and is made in the USA. 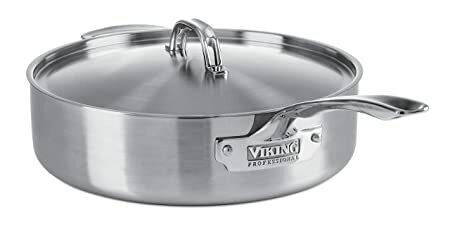 The Viking Professional 5-Ply 6.4 Quart Saut Pan delivers exceptional heat distribution and control with a nonreactive, stainless steel cooking surface. The wide flat base ensures plenty of space to brown ingredients, while the deep straight walls minimize splatters and evaporation. Includes 6.4 quart saut pan with lid. Viking, designed to deliver Professional Performance for Your Home. Viking Professional 5-Ply Cookware is constructed to maximize heat transfer for even heating across the base and up the sides of the pan. The stainless exterior features an elegant satin finish and is magnetic to ensure compatibility with all cooktops including induction. The three layer aluminum core works to transfer heat evenly and quickly throughout the pan. The 18/10 non-reactive polished stainless interior is easy to clean and maintain. The Professional 5-Ply Stainless Steel series is safe for use on all cooktops including induction, in the oven, broiling or on the grill up to 600F/315C (nonstick pans up to 500F/260C). This line features the Viking signature stay-cool handles, which are ergonomically designed to fit hands naturally to provide balance, leverage and grip. The side or “helper” handles and lid handles are designed to be easy to grip with a towel or oven mitt. Viking Professional 5-Ply Stainless Steel Cookware is dishwasher safe, includes a manufacturer’s limited-lifetime warranty and is made in the USA. The Viking Professional 5-Ply 6.4 Quart Everyday Pan delivers all of the features of a saute pan, takes up less space on the cooktop, in the oven or on a buffet when used as a serving vessel. From ossobuco to risotto, or from au gratin to cassoulet, this everyday pan is the ultimate cook-and-serve tool for the accomplished or aspiring chef. Includes 6.4 quart everyday pan with lid. Viking, designed to deliver Professional Performance for Your Home. 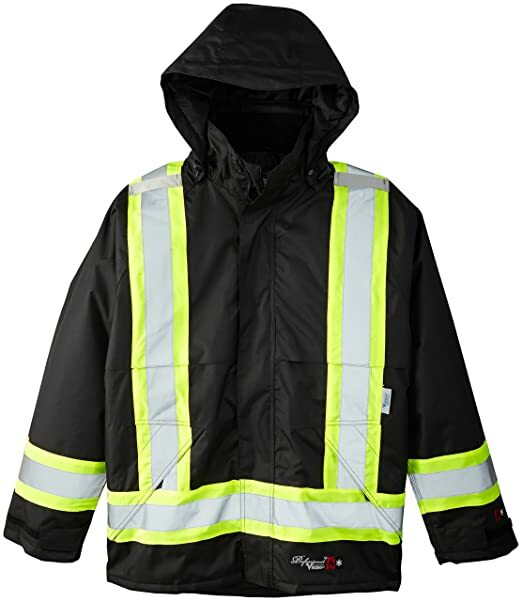 The Professional Insulated Journeyman 300D Tribal Jacket features a detachable insulated hood, a warm and comfortable fleece collar and a heavy duty zipper with storm flap for weather protection. The FR jacket has dual chest straps for ID badge, cell phone or radio and has front and back vents for extra breathability. 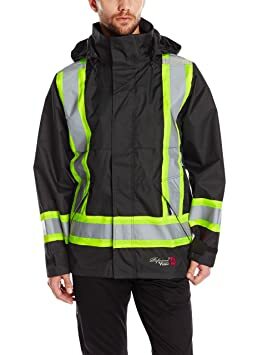 It comes with adjustable Velcro wrist closures to seal out the weather and has two large zippered pockets on the outside. Insulated for as low as -30C/-22F. Viking Professional 5-Ply Cookware is constructed to maximize heat transfer for even heating across the base and up the sides of the pan. The stainless exterior features an elegant satin finish and is magnetic to ensure compatibility with all cooktops including induction. The three layer aluminum core works to transfer heat evenly and quickly throughout the pan. The 18/10 non-reactive polished stainless interior is easy to clean and maintain. The Professional 5-Ply Stainless Steel series is safe for use on all cooktops including induction, in the oven, broiling or on the grill up to 600F/315C (nonstick pans up to 500F/260C). This line features the Viking signature stay-cool handles, which are ergonomically designed to fit hands naturally to provide balance, leverage and grip. The side or “helper” handles and lid handles are designed to be easy to grip with a towel or oven mitt. 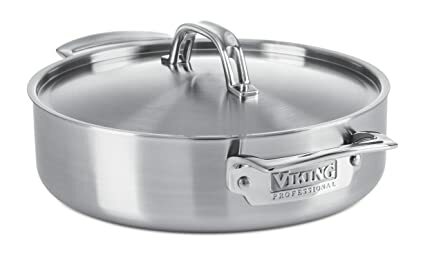 Viking Professional 5-Ply Stainless Steel Cookware is dishwasher safe, includes a manufacturer’s limited-lifetime warranty and is made in the USA. 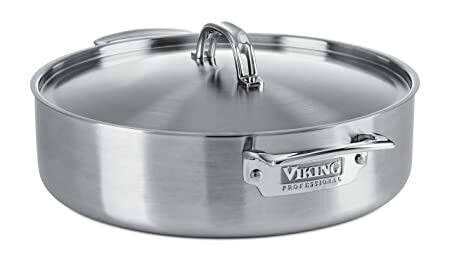 The Viking Professional 5-Ply 3.4 Quart Saut Pan delivers exceptional heat distribution and control with a nonreactive, stainless steel cooking surface. The wide flat base ensures plenty of space to brown ingredients, while the deep straight walls minimize splatters and evaporation. Includes 3.4 quart saut pan with lid. Viking, designed to deliver Professional Performance for Your Home. Viking Professional 5-Ply Cookware is constructed to maximize heat transfer for even heating across the base and up the sides of the pan. The stainless exterior features an elegant satin finish and is magnetic to ensure compatibility with all cooktops including induction. The three layer aluminum core works to transfer heat evenly and quickly throughout the pan. The 18/10 non-reactive polished stainless interior is easy to clean and maintain. The Professional 5-Ply Stainless Steel series is safe for use on all cooktops including induction, in the oven, broiling or on the grill up to 600F/315C (nonstick pans up to 500F/260C). This line features the Viking signature stay-cool handles, which are ergonomically designed to fit hands naturally to provide balance, leverage and grip. The side or “helper” handles and lid handles are designed to be easy to grip with a towel or oven mitt. Viking Professional 5-Ply Stainless Steel Cookware is dishwasher safe, includes a manufacturer’s limited-lifetime warranty and is made in the USA. The Viking Professional 5-Ply 3.4 Quart Casserole Pan delivers all of the features of a saute pan, takes up less space on the cooktop, in the oven or on a buffet when used as a serving vessel. From ossobuco to risotto, or from au gratin to cassoulet, this casserole pan is the ultimate cook-and-serve tool for the accomplished or aspiring chef. Includes 3.4 quart casserole pan with lid. Viking, designed to deliver Professional Performance for Your Home. Viking Professional 5-Ply Cookware is constructed to maximize heat transfer for even heating across the base and up the sides of the pan. The stainless exterior features an elegant satin finish and is magnetic to ensure compatibility with all cooktops including induction. The three layer aluminum core works to transfer heat evenly and quickly throughout the pan. The 18/10 non-reactive polished stainless interior is easy to clean and maintain. The Professional 5-Ply Stainless Steel series is safe for use on all cooktops including induction, in the oven, broiling or on the grill up to 600F/315C (nonstick pans up to 500F/260C). This line features the Viking signature stay-cool handles, which are ergonomically designed to fit hands naturally to provide balance, leverage and grip. Viking Professional 5-Ply Stainless Steel Cookware is dishwasher safe, includes a manufacturer’s limited-lifetime warranty and is made in the USA. The Viking Professional 5-Ply 10 Inch Fry Pan provides the home chef with the ability to scramble eggs, to saut vegetables, or to quickly sear meat or seafood to perfection before finishing in the oven. Designed with that versatility in mind, this fry pan combines low, flared sides for easy turning or stirring, along with a flat, nonreactive cooking surface that retains and distributes heat evenly. Viking, designed to deliver Professional Performance for Your Home. Viking, designed to deliver Professional Performance for Your Home. Viking Professional 5-Ply Cookware is constructed to maximize heat transfer for even heating across the base and up the sides of the pan. The stainless exterior features an elegant satin finish and is magnetic to ensure compatibility with all cooktops including induction. The three layer aluminum core works to transfer heat evenly and quickly throughout the pan. The 18/10 non-reactive polished stainless interior is easy to clean and maintain. The Professional 5-Ply Stainless Steel series is safe for use on all cooktops including induction, in the oven, broiling or on the grill up to 600F/315C (nonstick pans up to 500F/260C). This line features the Viking signature stay-cool handles, which are ergonomically designed to fit hands naturally to provide balance, leverage and grip. Viking Professional 5-Ply Stainless Steel Cookware is dishwasher safe, includes a manufacturer’s limited-lifetime warranty and is made in the USA. 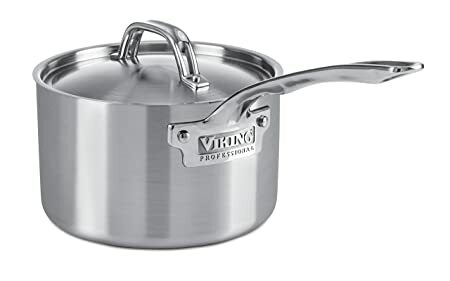 The Viking Professional 5-Ply 3 Quart Saucepan is designed and engineered to help the home chef make the perfect basic gravy or execute the most complex sauces that require even heat distribution and precise control. Whether quickly boiling water or making a delicate bearnaise sauce, the 3 quart saucepan is up to the task. Includes 3 quart saucepan with lid. Viking, designed to deliver Professional Performance for Your Home. The Viking Professional Performance 5-Ply Stainless Steel Non-Stick Fry Pan features the PFOA free, Eterna non-stick coating surface making cooking easy by requiring minimum amounts of cooking oils or fats, yet retains the searing ability of a traditional fry pan. Viking Professional 5-Ply Stainless Steel Cookware combines four professional grade aluminum exterior layers with an 18/10 stainless steel interior, to deliver the elegance, performance and quality expected from the modern home chef. The performance of this cookware is driven by three layers of aluminum alloy, bonded between the magnetic stainless steel exterior layer and stainless interior, which work in unison to deliver optimal heat transfer and cooking performance. Professional 5-Ply Stainless Steel Non-Stick pans are safe for use on all cooktops including induction, in the oven or on the grill up to 500F/260C. This line features the Viking signature stay-cool handles, which are ergonomically designed to fit hands naturally to provide balance, leverage and grip. Viking Professional 5-Ply Stainless Steel Cookware is dishwasher safe, includes a manufacturer’s limited-lifetime warranty and is made in the USA. The Viking Professional 5-Ply 10 Inch Fry Pan provides the home chef with the ability to scramble eggs, to saut vegetables, or to quickly sear meat or seafood to perfection before finishing in the oven. Designed with that versatility in mind, this fry pan combines low, flared sides for easy turning or stirring, along with a flat, nonreactive cooking surface that retains and distributes heat evenly. Viking, designed to deliver Professional Performance for Your Home.